A screenshot shows a fragment of the masthead of U.S. President Donald Trump's Twitter account, in Washington, Jan. 3, 2018. U.S. President Donald Trump's tweet warning North Korea's leader that he has a "Nuclear Button" that is "much bigger & more powerful" than Kim Jong Un's set off a series of sharp reactions Wednesday on Capitol Hill as the Senate gaveled in for its first day of business in 2018. "It's embarrassing, it's counterproductive and it's dangerous," said Senator Ben Cardin of Maryland, the Foreign Relations Committee's top Democrat. "It puts the president of the United States in the position of being a fool or deadly serious [about ordering a nuclear strike]," Democratic Senator Sheldon Whitehouse of Rhode Island told VOA. "We don't need that." But Republican Senator John Barrasso of Wyoming had a different view about the wisdom of the provocative presidential tweet, saying: "We finally have a president who is actually dealing with the problem at hand, instead of what we've seen previously, which was ignoring the problem." Vice President Mike Pence echoed that view in an exclusive interview with VOA on Wednesday. "President Trump has provided a kind of clear leadership on the world stage that has made immeasurable progress particularly with regard to North Korea," Pence said. "President Trump made it clear [that] America will not be bullied, America will not be threatened." On Tuesday, Trump tweeted: "North Korean Leader Kim Jong Un just stated that the 'Nuclear Button is on his desk at all times.' Will someone from his depleted and food starved regime please inform him that I too have a Nuclear Button, but it is a much bigger & more powerful one than his, and my Button works!" People watch a TV news program showing U.S. President Donald Trump's tweet while reporting on North Korea's nuclear threat, at Seoul Railway Station in Seoul, South Korea, Jan. 3, 2018. Nuclear experts have pointed out that, in fact, no such physical button exists. Rather, U.S. presidents have access at all times to communications equipment for ordering a nuclear launch. The system allows America to respond promptly to a nuclear attack from abroad. A growing number of Democrats have insisted that a preemptive U.S. nuclear strike against North Korea or any other adversary would require authorization from Congress as an act of war. "He [Trump] doesn't have a [nuclear] button he can use without us. No wars without Congress, period," Senator Tim Kaine of Virginia told VOA. "We [lawmakers] better make sure we hold him accountable for that and give him a little Constitutional education." Late last year, Democrats introduced a bill that would prohibit a U.S. president "from using the Armed Forces to conduct a first-use nuclear strike unless such strike is conducted pursuant to a congressional declaration of war expressly authorizing such strike." At a recent Senate hearing examining presidential nuclear authority, Republicans cautioned against creating any doubts on the world stage about America's nuclear deterrent and its determination to respond to threats. "Every single word that's been uttered here this morning in this hearing is going to be analyzed in Pyongyang, and they are going to look very carefully at how we, the American people, view this," declared Senator James Risch of Idaho. "One of the things that voters think about when they elect someone to the office of president of the United States is whether or not they want to entrust them with this [nuclear] capability," said Senator Marco Rubio of Florida. 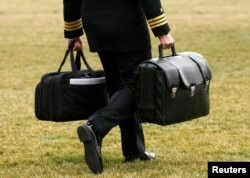 FILE - A military aide, carrying the "football" containing launch codes for nuclear weapons, accompanies U.S. President Donald Trump onto Marine One upon Trump's departure from the White House in Washington, Feb. 3, 2017. Contrary to what Trump tweeted, he has no physical button to initiate a nuclear launch. Trump's tweet came amid tentative steps to reestablish and broaden communications between North Korea and South Korea. North Korea reopened a cross-border communications channel with South Korea on Wednesday, the first significant sign the bitter rivals are seeking to improve relations after years of rising tensions. The sudden thaw in frosty ties between North and South Korea began Monday, when North Korean leader Kim Jong Un used his annual New Year's Day address to call for direct talks with Seoul and to announce his willingness to send a negotiating team to South Korea to discuss his country's possible participation next month in the upcoming Winter Olympics in Pyeongchang. Seoul responded Tuesday by offering to hold talks with North Korean diplomats next week, January 9, in Panmunjom. The meeting would be the first high-level inter-Korean talks since December 2015. Democrats accused Trump of sabotaging diplomacy at a critical moment. "The president always undercuts diplomacy," Kaine said. "If you undermine diplomacy, you raise the risk of unnecessary war." Pence, by contrast, argued that, under Trump's leadership, an unprecedented amount of non-military pressure is being brought to bear on North Korea. "After decades of North Korea stalling and ignoring the world community and continuing to develop nuclear and ballistic missiles, we're now literally beginning to see movement among nations in the region. China is doing more than ever before," the vice president said. While some Republican lawmakers simply ignore Trump's most provocative tweets, Democrats continue to blast the president's social media messaging. "I don't let my 11-year-old have a Twitter account, and I would suggest that somebody in the White House might want to do a better job of controlling the president's Twitter account," New Mexico Senator Martin Heinrich told VOA.